Warm out of the dehydrator (which was at a high temp all night because I wanted these to be ready this morning -aren't 100% raw but still gluten free!) 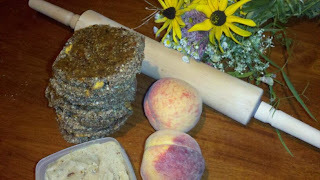 I buttered these peach protein cookies with my raw "caramel". I didn't write down the quantities as I went along creating these because in my mind I was just adapting the raw hemp protein bar recipe but the mixture turned out to be quite liquid so they became cookies instead of bars. Thus, quantities are approximate. The really great thing about dehydrator treats are that there is some room for give and take. Soak the dates in water, just so they are covered, for at least 30 minutes. Mix together in a large bowl: 1/2 cup hemp hearts, the milled flax, spices and salt. Using a food processor, make a paste using the rest of the hemp, the almonds, walnuts and coconut oil. Add the dates and soaking water and 2 peaches. Process until smooth. Pour the fruity nutty paste into the bowl and incorporate chia seeds. Let stand 5 to 10 minutes. If the texture is still liquid and doesn't hold well, add more chia. Chop the last peach into small pieces, mix these in delicately. Spread the batter onto a texflex/silicone or plastic wrap for a dehydrator tray. Dehydrate for a couple of hours. Flip the batter over, directly on the tray, removing the silicone/texflex or plastic wrap. Dehydrate another hour or so - these timings are just guidelines, go with how the batter feels. Separate or cut into pieces, form rounds and flatten slightly to shape as cookies. This recipe yields at least 10 large breakfast cookies. I dehydrated mine on high heat for about 10 hours total so they're not 100% raw. Dehydrating at 105F, you'll leave them for more than a day. They'll be firm on the outside but moist inside. Glaze them while they are warm and the "caramel" will be absorbed by the cookie. Pure, healthy, peachy delisciousness! If you don't eat them all right away, keep refrigerated in an airtight container.